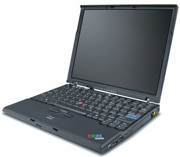 Posted on June 21, 2007 by Chad O.
NotebookReview.com has reviewed the Lenovo ThinkPad X61, Lenovo’s 12.1-inch ultraportable offering. The ThinkPad X61 that NotebookReview.com tested had an Intel Core 2 Duo 2.0GHz T7300 (2GHz) and 2GB of memory. They also compared it to a Lenovo ThinkPad X61s. The most surprising thing about the 12â€ X series laptops is it has a â€œfull-sizeâ€ keyboard. The primary letters, numbers, and function keys are all the same size as the larger 14â€ and 15â€ models, with only the outer keys reduced in size. This gives you a comfortable typing surface, that once you get used to the odd size outer keys, becomes a pleasure to type on. Build quality is 2nd to none, and it shows with the very precise quiet clicks that each key press gives as feedback.